We carry a large range of titanium hexagon head bolts in stock. They are manufactured to ISO 4014 and its equivalent standard DIN 931. Generally, the material covers titanium grade 1 (UNS N50250), grade 2 (UNS N50400), grade 5 (R56400) and grade 7 (R52400). 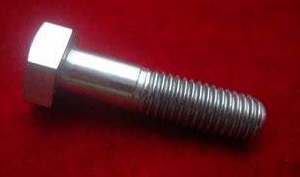 A typical titanium Gr.2 hexagon head bolt made to DIN 931 / ISO 4014. Size: M8 x 80 mm. The titanium hexagon head bolts are available in two product grades: product grade A for threads M1.6 to M24 and nominal lengths up to and including 10d or 150 mm, whichever is shorter; and product grade B for threads over M24 or nominal lengths over 10d or 150 mm, whichever is shorter. Technical drawing of titanium hexagon bolt according to DIN 931 / ISO 4014. *b1 refers to L ≤ 125 mm; b2 refers to 125 mm< L ≤ 200 mm; b3 refers to L > 200 mm. *For s, the nominal dimension is the same as the maximum dimension limit. *The pitches of the threads are listed respectively: M1.6 – 0.35 mm, M2 – 0.4 mm, M2.5 – 0.45 mm, M3 – 0.5 mm, M4 – 0.7 mm, M5 – 0.8 mm, M6 – 1 mm, M8 – 1.25 mm, M10 – 1.5 mm, M12 – 1.75 mm, M16 – 2 mm, M20 – 2.5 mm, M24 – 3 mm, M30 – 3.5 mm, M42 – 4.5 mm, M48 – 5 mm, M56 – 5.5 mm, M64 – 6.0 mm. *The nominal length L includes(all in mm): 12, 16, 20, 25, 30, 35, 40, 45, 50, 55, 60, 65, 70, 80, 90, 100, 110, 120, 130, 140, 150, 160, 180, 200, 220, 240, 260, 280, 300, 320, 340, 360, 380, 400, 420, 440, 460, 480, 500.